Can you identify these prominent Alabamians? They Too Call Alabama Homebegan as a speech at a local university in October 1983. In “Prominent Blacks in Twentieth-century Alabama,” I highlighted African Americans who had achieved success and called Alabama home. I made a promise after the presentation to develop the material into a book-length study. In 1983, however, I failed to anticipate that a doctoral dissertation and another book would forestall my efforts to develop such a study. This book focuses on the achievements of African Americans who were born in Alabama and made a name in the state. Also included are those who were born in Alabama but achieved success outside Alabama and those who came to the state to etch their marks on history. Some of the persons profiled in this book have escaped public acclaim. They Too Call Alabama Home seeks to relieve them of anonymity. To develop the profiles listed in the book, I combed newspapers, journals, magazines, and books. I also mailed out nearly two hundred inquiries so individuals might provide current information about themselves. I am thankful that some of those persons responded and saddened that time or resources did not allow others the opportunity to respond. Nevertheless, I believe the profiles listed in the book cover the spectrum of occupations—business, education, entertainment, politics, government service, military, religion, and sports—so that readers may learn something about persons who call Alabama home. At every opportunity I monitored news outlets to determine who might have died, married, or changed employment or residence since a profile had been submitted. I believe genealogists and students of Southern, Alabama, and local history will find much to appreciate in this book. High school students seeking a college major can examine the career paths of some of the persons profiled here, while college recruiters can use this book as a recruiting tool. Chambers of commerce may want to add the names of some local persons listed in the book to their brochures. A sense of satisfaction went into the writing of each page, and a feeling of fulfillment went out with the typing of the final word. It is unfortunate that so many black Alabamians lived and died without public acclaim. Still, persons with Alabama ties, like their peers across the land, persevered. This book is the result of the contribution of many persons. I would be remiss if did not acknowledge their help here. As editors, Pamela Ervin Brown, Geraldine Lang, Keflyn X. Reed, and William Llewellyn brought to the text different strengths and perspectives. They shared the trait of consistently asking the difficult questions and strengthening the weak arguments. Outside of Alabama, I found aid at the hands of the following individuals: David L. Poremba, acting manager, Burton Historical Collection, Detroit (Michigan) Public Library; Kelli Sample, clerk, Office of the House of Representatives of the State of Michigan; Don Smith, Pro Football Hall of Fame, Canton; Scot E. Mondore, associate researcher, National Baseball Hall of Fame and Museum, Cooperstown; Bernie Paschal, Rock and Roll Music Hall of Fame, Cleveland; Vicki Watkins, Page Library at Lincoln University, Jefferson City; officials at Tennessee State Library and Archives, Nashville; Larry Lester, Kansas City, Missouri; Bill Carle, Grandview, Missouri; Detroit mayor Dennis Archer and Albert H. Acker, deputy director, City of Detroit Communications and Creative Services Department; Christel Raasch, House of Representatives, Office of the Clerk, State Capitol, Atlanta, Georgia; Barbara Proctor, Florida A&M University; Ella Sykes, Edward Waters College; Robert McTyre, Michigan Chronicle; and Alma M. Fisher, Special Collection, Fisk University. C. Eric Lincoln provided some invaluable information. In Alabama I am especially grateful to Frances Dates, Savery Library, Talladega College; Ruthie Pitts, Murphy African American Museum, Tuscaloosa; George Lair, Alabama Music Hall of Fame, Tuscumbia; musicologist George Landry, Montgomery; retired educators, Elmira B. Clayton, Kathy D. Jackson, Gordon Pickler, and Ralph J. Bryson, all of Montgomery; Ellen Mertins, Dorothy Taylor, and Robert McNealy, Alabama Historical Commission; Frazine Taylor and Debbie Pendleton, Alabama Department of Archives and History; Louretta Wimberly, Black Heritage Council of the Alabama Historical Commission; Todd A. Etheredge, Alabama Sports Hall of Fame and Museum; Mildred L. Stiger, J. F. Drake Memorial Learning Resources Center, Alabama Agricultural & Mechanical University; Elizabeth Willauer and Yvonne Crumpler, Birmingham Public Library; and Calvin Binion, Quemeller Lane, and Alfred Murray, Alabama Legislature. 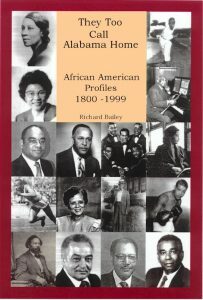 Barry Buford, Joe N. Dickson, Kathie Farnell, Horace Huntley, and Lettie M. Ross deserve special recognition for their interest in this book. Long before their deaths, Dr. Broadus N. Butler and Sen. Michael A. Figures encouraged me to continue to write. Sadie G. Penn has been one of my mentors, and so too was the late Dr. Reva W. Allman. I respect the wishes of others to remain anonymous. Despite the tireless efforts of many people, I alone accept the responsibility for the shortcomings of this book.